"A business leader’s job is to create great teams that do amazing work on time. That’s it. That’s the job of management." 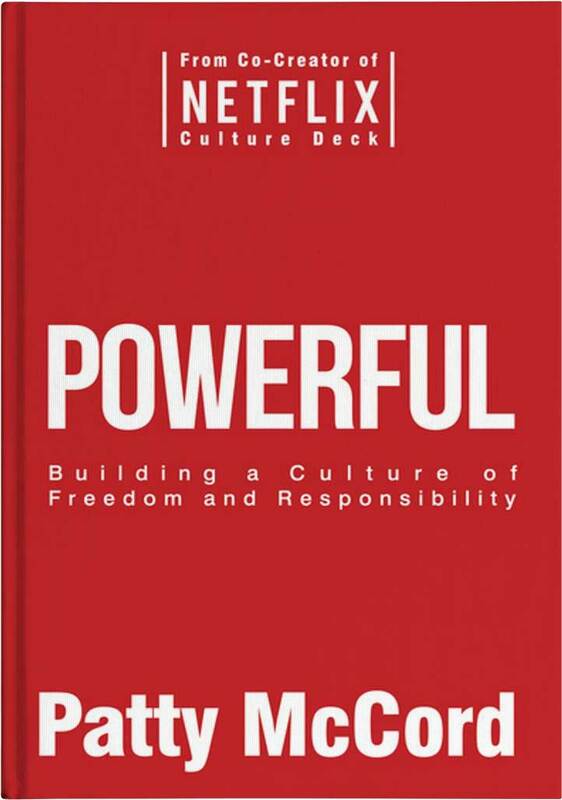 Patty McCord was the former Chief Talent Officer at Netlflix and in her 2018 book, Powerful: Building A Culture of Freedom and Responsibility, she shares her personal journey at Netflix. McCord highlights what worked exceptionally well and what practices where deemed redundant when building a high-performance culture that meets the demands of our rapidly changing business and workplace landscape. Coming from a HR specialist background, when McCord started at Netflix, she initially brought across the same old traditional business management thinking, models and practices. These included; employee engagement and empowerment, 360-degree anonymous feedback, and giving people perks and bonuses to incentivise and motivate their performance. McCord has always known that in practice, these models ultimately don’t work, as they are a relic of the past, and she knew deep in her heart that they were dysfunctional and not congruent with modern day values and principles. As a result, McCord assisted with the development of the Netflix Culture Deck alongside Reed Hastings, CEO of Netflix. McCord continued to work closely with Hastings during her 14 years as Chief Talent Officer to not only create one of the most successful media service provider companies operating today, but also created a workplace that flipped many of the traditional business and HR models on their heads. McCord discovered that the core role of management is to get the right people and teams, delivering a great product and service to your clients on time. Based on this one vital role of business leaders, Netflix went ahead and established a culture of both Freedom and Responsibility that I personally believe, all leaders and especially HR practitioners need to adopt into their workplaces. In her book, McCord convincingly argues that you don’t need to empower people, as workers walk into your organisation with power. In fact, McCord ‘hates the word empowerment’ – what a relief! Instead, she argues that a leader’s real job is to create the conditions for staff to exercise their power. To do this, you need to recruit and only keep fully formed adults and treat them accordingly. What I loved about McCord’s many stories is that she demonstrates again and again that ‘people can handle the truth’ and when you practice ‘radical honesty’, by giving each other continuous robust feedback directly – it’s a game changer for having a healthy culture full of adults who are learning, growing and getting to deliver on great work. When you work with a team of fully formed adults, you don’t need to incentivise them, offer them perks or bribe them to stay. Similarly, they also don’t need to be punished with more rules and policies to do the right thing. In fact, when you think about it, it is very patronising and paternalistic to institute old school practices of perks, policies and incentives. McCord challenges leaders to think of their organisation as a high-performance sports team and act accordingly. She says, ‘you’re building a team, not raising a family’ and when your job or work is done, it should be OK for that team member to move on and not be stifled by nostalgia, resistance to change or worrying about your retention measures. One of the most critical questions she believes leaders need to ask is “are we limited by the team we have not being the team we should have?” McCord also says that we need to ‘hire the people you need for the future now’ as this will keep your organisation agile and allow it to move at the speed of change. I found Powerful to be a must read, cracker of a book. It is an easy read but it is powerful, provocative, challenging and in essence, a liberating leadership and business book. The chapters are succinct with a summary of McCord’s essential point. It also provides the reader with a list of questions to use in a practical way that will allow them to apply the changes McCord is challenging us with. This is one of the most important leadership culture books you need to read, especially if you want to transform your workplace and relationships. If you are an old school company that is hamstrung by bureaucracy, hierarchy, childlike pettiness and divisiveness – all the more reason you need to read this book. It will compel you to adopt the new principles required to survive and thrive in our new world of agility and resilience. Richard Dore is the Managing Director at Proteus Leadership.